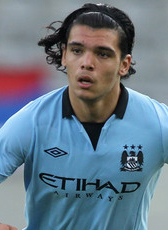 Feyenoord youth academy talent Karik Rekik moved abroad in June 2011. He was signed by Manchester City on a 4-year contract as promising player for their reserves selection. After featuring a few times in cup matches, he moved to Portsmouth on loan in the second half of the 2011-12 season. Defender Rekik made his first team appearance in the competition for Portsmouth but could not prevent the club from relegation. In summer 2012 he returned back to City looking for new opportunities at the club. For the 2013-14 season, Rekik went home signing a season loan deal at PSV Eindhoven in the Eredivisie. At the end of the season he returned to England looking for more playing opportunities during his two year lasting contract until June 2016. His Dutch club however signed the hot prospect for another season on loan. Rekik became league champions in the 2014-15 season with PSV. In June 2015 he returned to England for new opportunities abroad. He found himself a new club with Olympique Marseile. The defender signed a 4-year contract in France for a 5ME fee until 2019. In July 2017 he moved to Germany Hertha Berlin. The club signed the defender for 2ME on a 4-year deal.